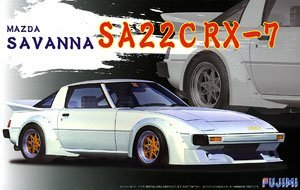 This kit differs from Fujimi's Super Mechanic series, the body no longer has slots around the head light lids and the floorpan is different and slightly better detailed. A full interior tub is offered and although the ID models can be motorized, the batteries (2x AA) are now hidden in the nose. This kit is basically the circuit racer version (kit nrs. ID-1 and SM-07) without racing decals. 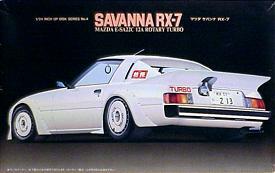 The decals in this kit depict an RX-7 E-SA22C with turbocharged 12A engine. Also new are the Impul wheels. 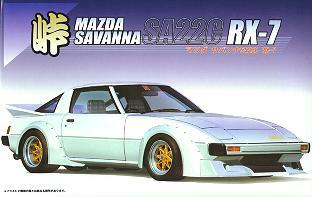 Note that the original 1st gen Rx-7 Turbo (manufactured exclusively for the Japanese market in 1984 and 1985) had the final FB22 body style, not the pre-1980 body style in this kit. This is a rerelease of kit ID-4 with new wheels. The kit comes with a choice of lefthand and righthand drive dashboards and the usual lot of spare items. The roll-over bar and the optional flat rear deck to replace the rear hatch and side windows are also still included in the kit, the headlights can be posed raised if desired. The decals still include 'Turbo' legends and a set of dials for the dashboard. Body is molded in white, interior and chassis are molded in black, aluminum plated 15in Technoracing TV-R wheels with Advan semi-race tires. This is a limited rerelease of the recent Tohge Nr.34 kit with new 15in Longchamp XR-4 wheels. The wheels are from new patterns, are nicely detailed and come fitted with 225/50VR15 Pirelli Cinturato P7 tires. Otherwise the kit and the decals are identical to the Tohge release. Body is molded in white, interior and chassis are molded in black, wheels are aluminum plated. New in this kit, and a nice surprise, is a big bore chrome plated metal exhaust tip, this exhaust tip is also available separately (Megaphone Style Short Muffler, Metal Muffler series nr.16, cat.nr. 11117). This is a rerelease of Tohge kit, the kit is identical to the Tohge release. 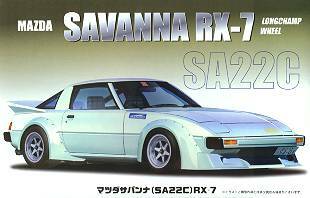 The decals consist of 'Turbo' legends, Japanese license plates and tax discs, a set of dials for the dashboard and some generic sponsor decals. Body is molded in white, interior, chassis and optional rear deck are molded in black, the 15in Technoracing TV-R wheels are aluminum plated and a small piece of aluminum tubing is included for the exhaust tip. 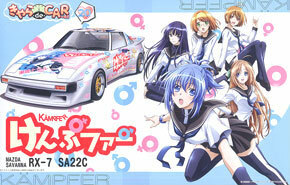 This is a rerelease of Tohge kit with an additional large set of Itasha decals. The kit comes with a choice of lefthand and righthand drive dashboards and the usual lot of spare items.